Let the party spill out onto the balcony when the weather's nice. Your chill vacation schedule means you can get more time in at the fitness center. The little ones can't get enough of the mushroom fountain. Grab a tube and lose count of your loops. Make the most of your night out with classic cocktails in the bar. 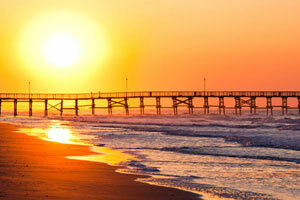 Beachfront stay overlooking the 1950's-classic Cherry Grove Fishing Pier. You'll always want just one more go-round on the resort's lazy river. Two towers perched along the Myrtle Beach shoreline overlooking the historic Cherry Grove Fishing Pier, Prince Resort strikes the perfect amenity/escape balance. Head up to the rooftop pool for the breathtaking views from the top of Tower 2, or grab tubes and drift along the lazy river until you lose count of loops. The mushroom waterfall in the kiddie pool in Tower 1 is a big hit with the little ones – or you can make your way straight to the beach. (It’s an easy walk back if you need to grab a frisbee or hat, or refill the snack bag.) Explore the marshlands in search of colorful wood ducks, or arrange spa treatments at the front desk. Save at least one night to spring for dinner at the beachfront 3500 Ocean Grill, timing it right to catch the sunset at its most spectacular. Later, make one last stop at either of the two hot tubs before calling it a night. Floor-to-ceiling windows maximize your views from the one-, two- and three-bedroom suites, while private balconies make the ideal spot for al fresco drinks. Well-appointed kitchens are equipped with all the right gadgets for making your family’s favorites. That said, there’s no shame in ordering out now and then. Unlimited DVD rentals are just the ticket after long days at the beach, when you can’t find the energy to venture out to nearby mini golf or a show. You’re in Myrtle Beach, so of course there’s golf, golf and more golf. Plus you’re right by the classic 1950’s Cherry Grove Pier (owned by the Prince family), with its two-story observation deck and impressive photo gallery of record catches. Check out the full service Bait and Tackle Shop for rod and reel rentals, or sample the menu at the Boardwalk Beach Café and Ice Cream Shoppe. Kids can’t get enough of Blackbeard’s Pirate Cruise and Myrtle Waves water park. And if you’re feeling really daring, try a helicopter tour over Myrtle Beach. Guests younger than minimum check-in age must have a parent or legal guardian present and staying in the same room.